^ Premier League clubs submit squad lists (PDF). Premier League: 23. 2 February 2012 [2 February 2012]. ^ 11. Ryan Giggs - Quote, Unquote. ManUtd.com. Manchester United. [8 August 2014]. （原始内容存档于1 May 2013）. 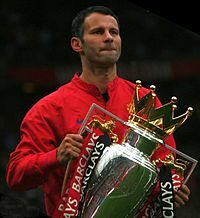 ^ Giggs earns prestigious PFA award. BBC Sport. 2009-04-26 [2009-04-27] （英语）. ^ Schalke 04 0-2 Man Utd. BBC Sport. 2011-04-26 [2011-04-27] （英语）. ^ Ryan Giggs: Manchester United star signs new one-year deal. BBC Sport. 2013-03-01 [2013-03-01] （英语）. ^ Endlar, Andrew. Ryan Giggs. StretfordEnd.co.uk. [29 November 2013] （英语）.